If your thinking about selecting a wicker chaise lounge chair for a special room in your home, patio or pool, there are some things you need to consider before you buy. A little background knowledge will help you make your final choice a little easier with no regrets. Depending on your application, you can consider a stationary chaise lounge chair or an adjustable one. Both types are available in different sizes and shapes. Color choices will vary by suppliers whether you choose a natural or a resin material. Stationary chaise lounges mean exactly that, no parts of the chaise lounge move. They are all fixed in position. Alternatively, an adjustable chaise lounge chair offers the ability to move the back rest in an array of positions from sitting straight up to all the way down to a flat laying position. Some chaises lounges require deep seating cushions to use the chaise whereas standard designs don’t need cushions. In as much as chaises are sold without cushions, most people like to to use their chaise lounge with cushions. Two basic cushion choice styles prevail in the market, tufted and foam cushions. Tufted cushions are more economical than foam cushions. But don’t let that sway your decision if your looking for a cushion with superior support and longevity. Tufted cushions do a very adequate job in comfort and decor. Foam cushions take both comfort and decor up a few more levels. 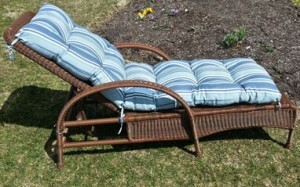 Stationary chaise lounges use two cushions, one for the back cushion and one for the seat. Adjustable chaises use a single cushion that has built into it the ability to bend at the hinge were the back moves. Depending on how you want to use a chaise lounge, you will probably favor one style frame over the other. If your primarily going to use a chaise for relaxing, reading, socializing and watching the TV, a stationary chaise lounge chair is probably you best choice for you. 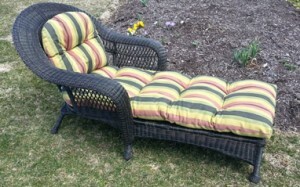 The chaise is ready to go when you are. You just sit in it and use it. On the other hand, if you use your chaise by the pool or a sun worshipper and do a lot of outdoor tanning and sleeping on the chaise, then an adjustable chaise lounge is the model that will suit your needs better. The back will need to be adjusted before you use it its not in the desired position. The length of the chaise seat. Average length is usually between 52 and 55 inches. If you have long legs, make sure you don’t get one of those short ones available at the local box stores. Chaise lounge chairs are versatile pieces of furniture to use in many different situations around your home both inside and on the patio. Choosing the right chaise lounge frame and the the right cushions will ensure you will get the most of or your furniture and enjoy it for many years to come.